It’s my first topic here, I hope this is not so bad. I have been following Big Pippin for a few weeks now and I would like to use the way he looks at charts (at least how I see it) to place my orders. I will be watching this pair for the coming days to see if I can enter. No fundamentals considered here, just the descending channel that it’s been on since April. I’m waiting for it to hit the 0.66200 area as its resistance but will also be waiting for bearish confirmation before placing an order. If it goes through SL will be at 0.67300. Anyone also following the same pair? Hi, I´m short with the Kiwi. My TP placed at 0.6420. Good downtrend. I was short this but exited in front of the growing strength this week (well before price hit my stop-loss). I am thinking of setting a sell order below the low of a weak day next week but I would like to see a bit more price weakness before entering so it could be Wednesday before I move. At what level did you short? By the looks of it mine could be around the same time also. We’ll see. I’m tempted to “adjust” my trade but I’m not sure that’s smart so I will keep an eye on this pair until mid-week this week. If it continues to drop… bye bye. I’m not going to keep chasing and adjusting my trade idea to fit what it’s currently doing. I’ll try again in a few days but I still have my eye on this one. @tommor Let me know when you get triggered! I´ve closed my short position, i´m long now waiting the kiwi above 0.6607. Few pips at my short but at least profitable. The bearish channel on the NZDUSD, daily chart, is very consistent and predictable. It is true that the pair may try to bounce to the downside from the 0.6600 level when that zone has been acting as a resistance, along with the 55 day EMA. To the downside, the 0.6500 level may act as support. Few pips at my short but at least profitable. Good for you! Will look for another potential entry point now. Good luck! I should have lowered mine to the 0.6600 area instead of 0.66200. I would have been in at this point. Need to be be better at identifying zones. The NZDUSD drops 100 pips from the 0.6600 level to the 0.6500 level, which may act as support. The pair may actually consolidate between those two levels, a breakout of either level may accelerate its momentum. The NZDUSD goes back to the 200 day EMA around the 0.6774 level, which acts again as resistance. In case of breaking out above that level, its next resistance could be the 0.6858 level. In case of another bearish bounce from the 200 day EMA, the 0.6700 level could act as support. 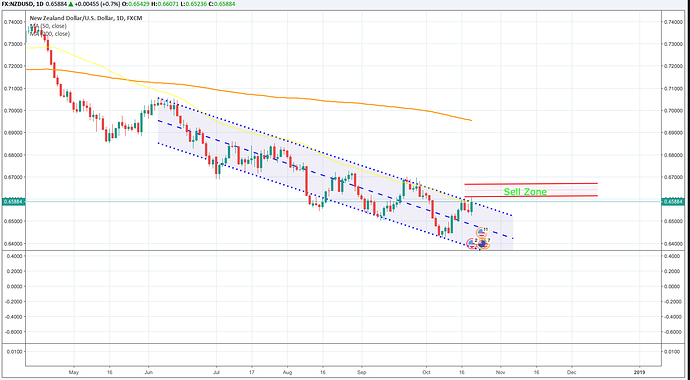 The NZDUSD confirms the breakout above its 200 day EMA at the 0.6774 level and it could reach the 0.6858 level, which could act as resistance, but before that, the price may stage a breakout and pullback pattern around the 200 day EMA. To the downside, the 0.6700 level is still its most relevant support. 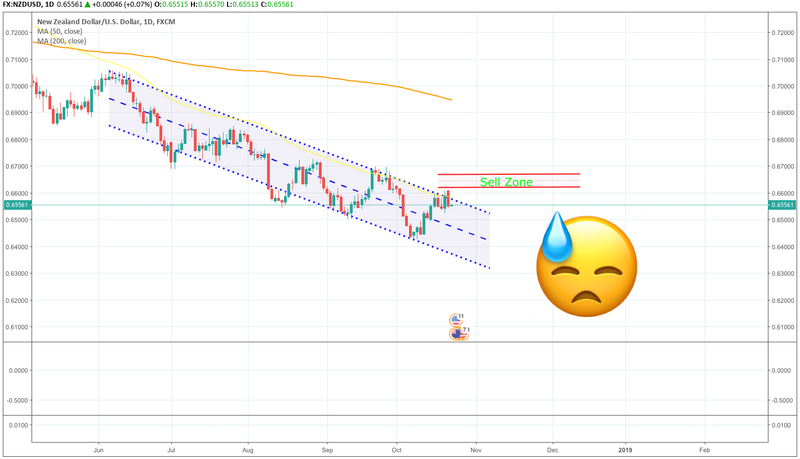 NZDUSD appears to have more room to head further northward and we may see bulls attempt the 0.70430/0.72000 resistance area in the weeks ahead. On the daily time frame, price action breached a descending trendline (red) on November 1, 2018 and is now respecting an ascending trendlne (black) from recent lows. As long as the trendline holds, we may see bulls continue their control of the market. However, as price action is presently located at a horizontal S/R area, we may see some sideways or a brief retracement to a value area before a bullish continuation. Interesting price action on the NZDUSD. Now that is has broken below the 200 day EMA at the 0.6777 level, the price may try to drop towards the 55 day EMA at the 0.6687 level. Below the 55 day EMA, the pair has the road practically clear all the way to the 0.6500 level. Above the 200 day EMA, the peak at the 0.6868 zone could act as resistance. Above the 200 day EMA, the peak at the 0.6868 zone could act as resistance. Looks like this is what’s happening. Happy I didn’t force my short trade on this pair a couple of weeks ago! Who has open trades on this one? Good you didn’t go short, the 200 day EMA at the 0.6777 level has acted as a good suppor and the pair has now bounce to the high at the 0.6883 level, where it may form a double top formation. No position on this one for now, just waiting to see what happens at the 0.6883 zone from where it may bounce to the downside, or break it to the upside. On the other hand, the price may just stay consolidated between the 200 day EMA and the resistance zone at the 0.6883 level. Ah yes, I see what you’re saying. Looking at the 0.6883 level also. Maybe I’ll have a better setup this time around. Will keep looking. What other pairs are you looking at? Recent price action on the H4 time frame has a top ‘wicky’ formation at a horizontal resistance area; which is indicative of a weakening of a bullish push through the area. Price action has failed to close above the high of November 16, 2018 in spite of several attempts by bulls. We can see a mini consolidation channel, a wedge pattern (magenta) formed around the present location of price action. A southward breakdown of the wedge is apparently imminent.